Better to Reign in Hell . . .
At least that's what Lucifer thought. But when you take a closer look at the home that he and the other Fallen have carved out for themselves, you might have a different opinion. Heaven, on the other hand, is a lovely place – but even Paradise may not be what mortals expect . 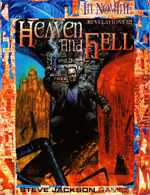 . .
Book Three of The Revelations Cycle, Heaven and Hell gives players and Game Masters alike a closer look at the Celestial Realms of the In Nomine game universe. Each Principality of Hell and Heaven is described, with adventure ideas geared to it. 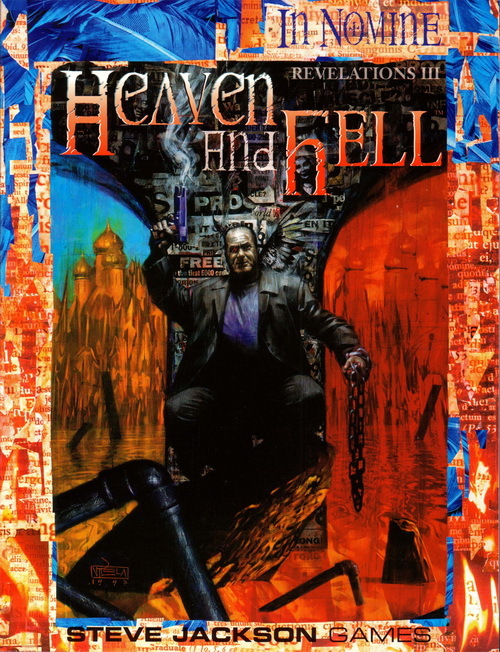 Heaven and Hell also portrays four Superiors in more detail, introduces two new Superiors, adds rules for adventures in the Celestial Realms, and includes "No Dinero," a complete adventure. You will need the In Nomine basic rulebook to play. Books One and Two of The Revelations Cycle, Night Music and The Marches, are useful but not necessary.